-Many good conversations. We were able to share about who we are and what we are doing with several curious/seeking families. We were able to make good connections with other believers that could be sources for referrals. -We put smiles on many faces. 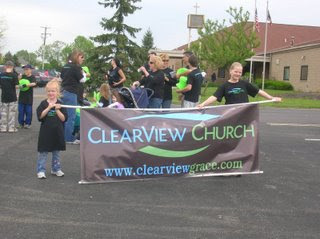 Our objective was simple–put smiles on faces and associate the smiles with ClearView Church. I believe Jesus was pleased today as we ministered to hundreds, maybe more than a thousand, people. -We gave away all 750 of our ClearView logo Frisbees before the parade was two-thirds over. We should have brought about 1200! It was fun to see kids scrambling all over the parade route to grab one! We had something everyone wanted! There was only one casualty (woman getting hit…by one of our ADULTS tossing one after telling the kids not to!). -We had GREAT ownership from our team and friends in helping during the parade and at our both. Friends drove all the way from PA and Cleveland to help paint faces. Two ladies sat in a chair for five hours and painted hundreds of faces. The line for face painting was almost always about 15 kids deep. Friends also came from Northwest Chapel and Polaris GBC to help during the parade. And, our teammates showed up big-time and pitched in to help with smiles. My sister and mom helped with our kids so Trish and I could serve during the day. I was pleased. -We painted hundreds of faces and gave away hundreds of balloons. -We were able to make many repeat contacts (seeing people we’ve initiated relationships with from other venues like festivals, pre-school, etc.) and further conversations. -All in all Saturday was a great day. Praise God. Please pray that these contacts would translate into 1) people we can minister to and/0r 2) teammates. Thanks for praying. To top it off, Sunday we had our highest ever attendance at our home for our worship gathering (24). We’re excited to see new faces and praying we can gain another family or two for our next milestone moving towards public launch this fall–getting out of our house and into a rented facility. Praise God for movement!